Mugwump's Subfield label introduces its first signings with the Belgian-Italo duo Front De Cadeaux (brilliantly named after the Belgian EBM pioneer group FRONT 242). Front De Cadeaux are DJ Athome & DJ Hugosan. Hugo runs the Roccodisco label with Italian disco mastermind Rodion (Gomma/Nein) while Belgian killer DJ Athome has been spinning Italo wave & House in Brussels since the 90's. They expertly produced their own brand of "Supreme Rallentato", which is a fucked-up slo-mo italo, acid, disco, techno and house hybrid that so rightly fits with Subfield's mission statement of covering subgenres. Their 2 first outings on Roccodisco have been remixed by Fabrizio Mammarella and Optimo's JD Twitch, and a staple in Ivan Smagghe's sets. 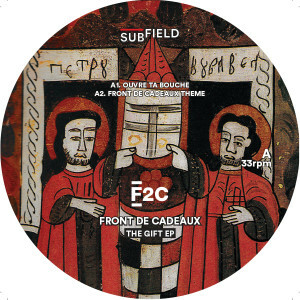 This full Ep on Subfield features 2 original F2C obscene & dirty slo-mo tracks at their most playful, "Ouvre Ta Bouche" and "Front De Cadeaux Theme" plus the magnificent dub-house of "Killers". Remixes comes courtesy of Factory Floor's Gabe Gurnsey (DFA) in a quite brutal bleep-techno mood and Manchester's nu-balearic kingpin Ruf Dug (Music For Dreams), getting into what he described as a " 808 snare roll warehouse analog fucked-up version". Don’t sleep, it’s a biggie.